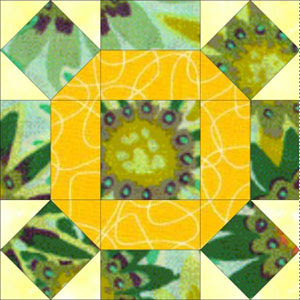 To celebrate the arrival of spring, members are invited to make the block of the quarter using green and yellow fabrics. This is a Broken Wheel block. All the instructions for this 9in (finished) block are in the current issue of The Template newsletter but here is a colour image for a guide. Bring your blocks to the Burwood meeting on Saturday 2821 November and hand them in at the welcome table near the entrance to the meeting room OR mail your blocks to reach the Guild office by Tuesday 2417 November.